When Chinese women bound their daughters’ feet, many consequences ensued, some beyond the imagination of the binders and the bound. The most obvious of these consequences was to impress upon a small child’s body and mind that girls differed from boys, thus reproducing gender hierarchy. What is not obvious is why Chinese society should have evolved such a radical method of gender-marking. Gendering is not simply preparation for reproduction, rather its primary significance lies in preparing children for their places in the division of labor of a particular political economy. 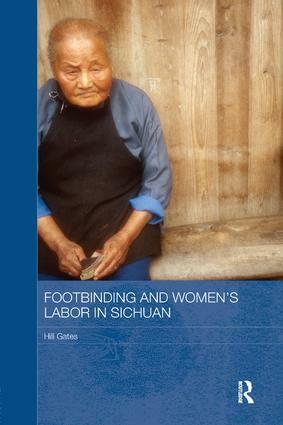 Drawing on extensive fieldwork and interviews with almost 5,000 women, this book examines footbinding as Sichuan women remember it from the final years of the empire and the troubled times before the 1949 revolution. It focuses on two key questions: what motivated parents to maintain this custom, and how significant was girls’ work in China’s final pre-industrial century? In answering these questions, Hill Gates shows how footbinding was a form of labor discipline in the first half of the twentieth century in China, when it was a key institution in a now much-altered political economy. Countering the widely held views surrounding the sexual attractiveness of bound feet to Chinese men, footbinding as an ethnic boundary marker, its role in female hypergamy, and its connection to state imperatives, this book instead presents a compelling argument that footbinding was in fact a crucial means of disciplining of little girls to lives of early and unremitting labor. This vivid and fascinating study will be of huge interest to students and scholars working across a wide range of fields including Chinese history, oral history, anthropology and gender studies.